Depressing and distressing sightings of diseased sea trout continue to make news. Please continue to inform this website or the hon sec of ongoing concerns. We can only hope that warmer water will bring new and clean fish from the tide and that in time more will be understood about this blight on our wonderful ‘springers’. A walk today on a moorland stretch gave up dippers, grey wagtails, bluebells, wild garlic and the first call of a cuckoo . . . .the usual suspects and more. All was well. . . .almost. DFA AGM 6.30 p.m this Friday 17th at Dartmoor Lodge. All welcome. Meeting, Q and A, and buffet. Sea trout continue to be caught in TWP with one or two good of size amongst them. 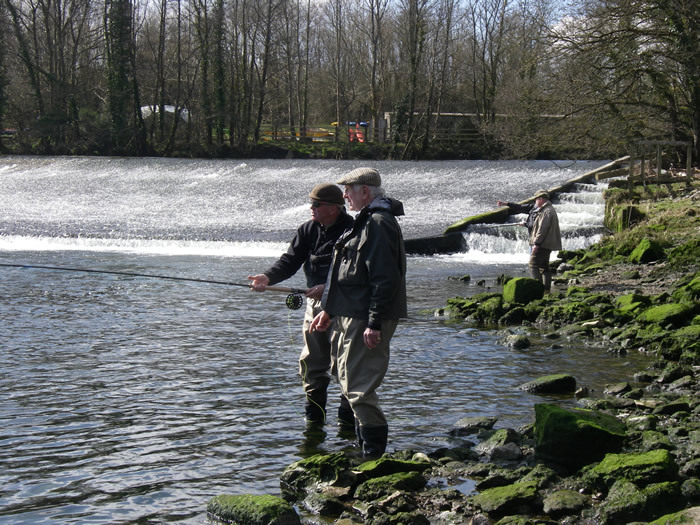 Members have observed numbers running the weir (salmon included), and fish have been spotted as far up as Haliwells. Upriver angling effort appears to have been minimal so far. Members wishing to fish Totnes weir pool from the town side will see that barriers have been erected by the developers. We do have access, and the combination numbers are the same as at Dart Bridge and Kilbury weir. Several more sea trout have been caught at TWP. About a week ago, Paul Hetherington (Bush), caught a sea trout of around 3lbs from TWP. As far as we know this is the first (and only) confirmed fish to come off the river. With further unsettled weather forcast for the coming week conditions are more likely to favour salmon fishing. We are fortunate to have casting instructor Nick Taylor as one of our number. 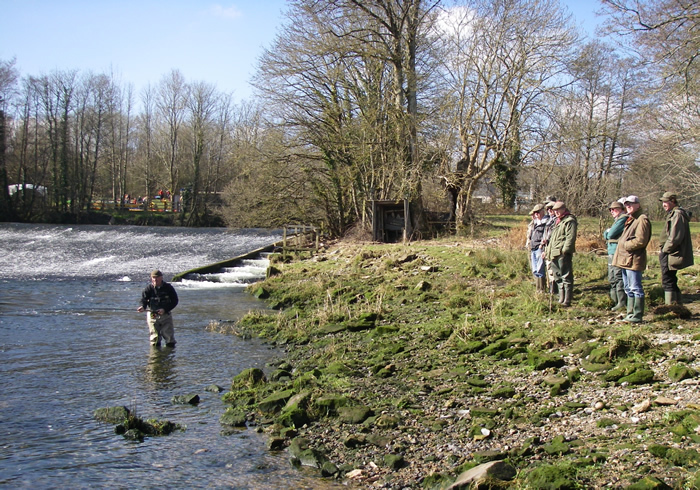 A Spey casting workshop was conducted by Nick on Saturday at Totnes weir pool and was well received by those who attended. Some came to watch and learn while most came with rods at the ready and were treated to some top class practical tuition. Novice Spey casters were able to learn the basics and those more experienced were able to get advice on how to iron out any bad casting habits they may have aquired along the way. Many thanks to Nick for donating his time and skill. It is hoped to provide more of these workshops in future. Meanwhile Nick is available for personal tuition at a very reasonable price!